But wait… we have one more day! Oh glory, I was so accustomed to Stampin’ Up! and their deal of the week starting on a Wednesday and finishing on Tuesday night that I automatically wrote that last night without realising that next Wednesday is the last day of June and as such will be the closing day for deal of the week instead of the usual Tuesday. Works MUCH better for me so hope it does for you also!!! Today is bit of a blur as I had both children home with nasty coughs, fortunately though yesterday was a different case with the “Card Crusaders” I meet with fortnightly. We were all set the challenge of demonstrating a card using any technique we liked. As if my head wasn’t hurting enough this last week, I then had to decide on one technique amongst the hundreds out there… yeah right! Actually it wasn’t such a hard decision as whenever I think of techniques I always think of embossing, and heat embossing at that. Anything to do with heat embossing is my idea of a good time so I went with the resist embossing technique as I’ve seen some truly inspiring work of late which I wanted to have a bit of an Inkee Fiddling with myself. The small difference between simply heat embossing and the resist embossing technique is that you stamp your chosen image with Versamark for heat embossing with your preferred embossing powder. 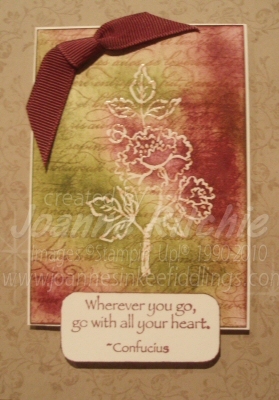 In this instance I’ve chosen clear embossing powder for this card as I wanted the background image I had stamped to show through the embossing. BUT… Rich Razzleberry and Old Olive were then sponged over the image although I’ve not done this very heavily this time as once again I wanted the stamped background image just peaking through. Once sponged the image had a quick wipe over with a paper towel to remove any ink on the embossed image. On assembling the card it was obvious that even though the kraft cardstock worked for this card it simply wasn’t enough so with the Versamark I stamped that beautiful vines stamp found in the Vintage Vogue set all over the background. By using the Versamark it gives the image that wonderful watermark appearance. Of course I did have something very different in mind when I started but it simply wasn’t coming together so next week I may attempt that one again… maybe!